Last week we had a very successful giveaway from UKHosting.com. and today we are ready to announce our winners! UkHosting is a UK based company that offers fast and reliable servers with awarded 24/7/365 support. 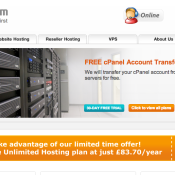 UKHosting.com offers powerful web hosting, reseller hosting and VPS hosting services.